A decade or two ago, the telephone wire heading into your home was a quaint way to chat with your family and friends when you couldn't speak to them in person. The basic idea hadn't changed much since the 1870s, when Alexander Graham Bell (1847–1922) and others pioneered telephone technology. But in the 21st century, people have started to see telephone lines a different way: now they're broadband Internet connections, piping music downloads, YouTube videos, news, and information—as well as telephone calls—into our homes 24 hours a day. Streaming media (a way of playing files as they download) has been a central part of this information revolution. What is it, exactly, and how does it work? Let's take a closer look! Artwork: The concept of streaming media: transmitting a movie, TV program, or other video across the Internet for viewing on a PC or mobile device. Photo: BBC iPlayer is a pioneering "on-demand" television and radio player that streams programs down your Internet connection in "real time." That means programs play at the same rate they download, and each program takes roughly the same time to watch via streaming as it would if viewed live on your television. If a picture is a worth a thousand words, a moving picture is worth a million. But how do you cram all that information down a telephone? The trouble is that a couple of copper wires—the basic technology behind our home phone lines—cannot, ordinarily carry information quickly enough to bring things like radio and TV into our homes. If you've ever watched a fax machine chugging along, sending or receiving a printed document at a grindingly slow speed, you'll know just how slow telephone lines can be at carrying anything other than a person's voice (the only job they were ever designed to do). In the days when most people had dial-up Internet connections (where you make a connection to your Internet Service Provider using a modem to enable what is essentially just a normal telephone call), slow speeds were a major limitation on what could be done online. If you wanted to listen to an MP3 music track (typically about 5 megabytes in size), you could spend half an hour waiting for the entire file to download onto your hard drive, then open it up and play it back. Video files (more likely to be 50 megabytes) would take several hours to download this way, so they were not generally available on the Net. In those days, it was impossible to listen to a music or movie file of any size without a long and tedious wait. The problem was essentially a matter of bandwidth: the speed of an Internet connection (how quickly it can download information) sets a limit to how quickly you can transfer a file. In the mid-1990s, in the early days of the Web, Rob Glaser and his Real company (originally called Progressive Networks) pioneered streaming media as the solution to this problem. The basic idea is simple. Suppose you want to watch a large video file on your PC. You install a media player (a streaming-media-playing program) on your computer that plays the file while it downloads. So it downloads maybe the first 10 seconds of the file, stores or buffers it, then immediately starts to play it. As the media player starts playing the first part of the file, it's also downloading the next 10 seconds ready for when you come to that bit. The media player never actually stores more than a little bit of the entire file: once it's played part of the file, it deletes it to make way for the next bit. If the media player can download the file as fast as you're watching or listening to it, you'll see no interruptions; if there are delays in downloading for any reason, there will be occasional pauses while the player downloads and "buffers" the next bit of the file. Photo: Streaming media as it used to be. This is an early version of RealPlayer (the program that kick-started the streaming media revolution) playing here over a 56 Kbps dial-up Internet connection. The status bar at the bottom shows the radio station is being played at 44.1 Kbps (over 44,000 binary digits per second), which is well within the limits of the connection. The trick with streaming media is for the player to adapt to the limits of your Internet connection to avoid excessive buffering. Before we go any further, we need to know more about how the Internet works. Downloading: Unpredictable: Download time is unrelated to playing time. A music album could download in 5 minutes or 5 hours depending on its size, your net connection, and web traffic. Streaming: Real time: Generally, a 1 hour video will stream in roughly 1 hour (though there may be occasional delays caused by buffering); unlike downloading, streaming media can be used for "live-live" transmission of events as they happen (also known as webcasting). Downloading: Uses traditional Internet packet communication (technically known as TCP/IP) with a system that automatically corrects errors. Any lost or damaged "packets" (downloaded chunks of data) are retransmitted. The file you eventually receive on your computer is an exact copy of the file that was on the server. Streaming: Packet losses are ignored (lost and damaged packets are not resent), but that doesn't usually matter because digitally streamed video and audio is converted back into analog format before we watch it or listen to it. Any packets lost during streaming simply add "surface noise" to an audio stream or degrade the picture quality of a video (for example, with excessive pixelation (where the picture disappears into square blocks). Downloading: A download is a single file with all the relevant data packaged together. So if you're downloading a movie, everything is packaged into a single movie file with a filetype something like MPEG4. Streaming: If you stream a movie, each different part of the movie (sound, video, subtitles, or whatever) is transmitted as a separate stream. The movie player reassembles and synchronizes the streams as they arrive at your computer. In terms of bandwidth, these multiple streams are additive: if you're back in the Dark Ages with a slow 56 Kbps dial-up modem, you could happily watch a 20 Kbps audio stream and a 30 Kbps video stream together, but any extra streams would cause periodic pauses and buffering. Downloading: Downloads work through traditional web-serving methods (technically known as the HTTP and FTP protocols) with any conventional web server. The same version of each file is served to everyone. Streaming: Streams use RTSP (real-time streaming protocol) and need to run on a server specially geared for streaming. When you go to a web page that offers streaming media, you're generally redirected to a separate streaming server. There are typically different versions of each file that have been optimized for different connection speeds (for example, a low-quality version for dial-up and a high-quality version for broadband); in practice, different files are served to different people. Downloading: Files can be instantly uploaded to a server for immediate downloading. Streaming: Files have to be compressed (perhaps using smaller video frames or fewer frames per second) and then encoded (turned into discrete, digital packets) before they can be streamed. People watching or listening to streamed files have to have appropriate decoding files installed on their computers (known as codecs) for turning encoded, computerized, digital files back into analog sounds and pictures that human ears and eyes can process. In practice, that means you need a plugin in your web-browser to handle whatever streaming media files you want to receive (and you'll need separate plugins for QuickTime, RealPlayer, and so on). Streaming: In traditional streaming (unicasting), each client takes a separate stream from the server—necessarily, because different people will start streaming the same video or audio program at different times. Multicasting is a more efficient kind of streaming that allows a streaming server to produce a single stream that many people can watch or listen to simultaneously—for example, if lots of people are watching a football game live online at the same time. Some media players automatically use multicasting when they can. Downloading: Downloaded files tend to be in standard formats (such as MP3) that play easily on any computer or operating system. Streaming: There are three rival, proprietary streaming systems (more formally known as architectures—RealPlayer, Apple QuickTime, and Microsoft Windows Media Player), and though they're much more compatible than they used to be, it's not always possible to play files designed for one player on the others. Downloading: Downloaded files are, by definition, copied onto the viewer's computer. They're easy to email, post on other websites, and repackage or resell—causing major copyright issues. Photo: Genuine streaming: Apple's QuickTime offers a choice of streaming music and movies. It's only one of three rival streaming technologies. Most Internet radio stations use genuine streaming, downloading and playing simultaneously with a program like RealPlayer, Apple's QuickTime, or the Microsoft Windows Media Player (the three rival types of streaming). With a broadband connection, you can enjoy audio quality that's not far off the quality you get from a downloaded MP3 file (though, as we discuss in our article on MP3, that's never quite as good as you'd get from a CD). As Internet connections have become faster, and more people have broadband, it's become possible to watch videos and TV programs this way too, though unless you stream in high definition over a really fast broadband line, quality is still far short of what you'd get from watching TV or a DVD. That's one reason why online movie stories still sometimes use downloads instead of streaming. Not all websites that appear to stream video work by streaming. Some (including YouTube) actually use an alternative approach called progressive downloading (fast-start streaming), which is like a cross between conventional downloading and streaming. It's popular because it's often quicker and easier to implement than genuine streaming. A large chunk (and sometimes all) of the file you're watching downloads into your web browser's cache (its internal working memory buffer) and your browser plays it simultaneously. Unlike with a truly streamed video, you can't always skip forward: generally you have to wait for the file to download to the point you want to see. Another key difference is that the file remains in your browser cache even when you've finished watching. You can tell when a website is working by progressive downloading because the video window will show two separate indicators on a progress bar, like the one below: one shows you how much of the file has downloaded, while the other shows how much you've played. Until recently, almost all progressive downloading used Macromedia Flash files (with SWF or FLV extensions), that are served from a conventional web server and played on a Flash plugin installed in your browser. Following the arrival of HTML5, modern browsers (including the slimmed-down ones on smartphones) can now do this themselves without using Flash at all. Photo: A progressive downloading progress bar. When you see this, you're not actually streaming a video—you're playing it as you download the entire thing. If you know how to look in your browser cache, you'll probably find the file is sitting in there somewhere after you've played it (look for a very big file or one with a very new date and time, but don't expect to find a meaningful filename or extension). The artwork below, taken from Rob Glaser's original patent, shows how streaming media was originally designed to work. The figure on the left shows how sound is packaged and sent as digital data to your computer (the purple box at the bottom); the one on the right shows how your computer receives, unpacks, and turns this data back into sound. Let's look at these two steps (transmission and reception) in a bit more depth. Artwork: How streaming works in a Real Player. From US Patent: 5,793,980: Audio-on-demand communication system by Rob Glaser et al, Real Networks, August 11, 1998, courtesy of US Patent and Trademark Office. 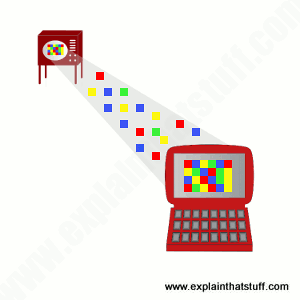 Live or recorded sound (red boxes) is made from analog (continuously varying) sound waves. So, at the transmitting end, the first step is to convert these waves into digital data using an analog-to-digital converter (green). If the source of sound is digital to begin with, we can miss this step out. Next, the digital data is compressed (orange) by over 95 percent (in the original patent, they quote a figure of 22:1) so it can be transmitted more quickly. The compressed digital data is stored (light blue) and then progressively transmitted by a server (dark blue) over the Internet (yellow) to your PC (purple). Of course, there's no reason why lots of programs can't be compressed and stored indefinitely in a library and then streamed whenever people want to listen to or watch them, but don't forget that Real Player was originally designed so it could stream things like live radio shows as they were transmitted from the studio. 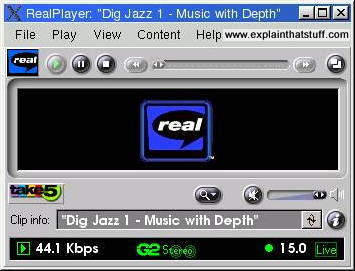 It's also worth noting that the original version of Real Player shown here was designed to be able to send real-time audio across grindingly slow dialup Internet connections (as slow as 14.4 Kbps); modern streaming can send high-definition video over broadband connections hundreds of times faster, but works in essentially the same way. Inside your PC, a similar process runs in reverse to turn the digital data you receive back into sound. Packets of data are received down a phone line from the Internet (yellow) and stored in buffers (small bits of DRAM memory, blue). The buffers are designed to be as full with data as possible: if they're too empty, because the audio isn't being transmitted fast enough, there's a risk of the audio playback being interrupted (which is when you see the annoying "Buffering" message). The data from the buffers is decoded and decompressed (orange) and passed to a wave driver in a sound card (light gray), which generates streams of audio still in digital format. A digital-to-analog converter turns these streams into analog signals that power a loudspeaker, hopefully recreating a faithful version of the original sound (red). Garbage in, garbage out—so goes the old saying in the computer business. So if the data from the "transmitting" server gets corrupted, won't you hear poor quality audio from your loudspeaker? The modems sending and receiving data use error control/correction protocols to ensure that the data that's received is the same as the data that's transmitted. The audio and video information you download has to be compressed dramatically (substantially reduced in quality to make smaller files) so it downloads in a reasonable amount of time. Most streaming videos are still quite small and "pixelated" (full of obvious square blocks) when they play on something like YouTube. That's because even today's best broadband connections are not fast enough to download the huge amount of information in a fullscreen, high-definition TV picture. In a few years time, when broadband connections are many times faster, it will be possible to stream HD-quality video over the Net. Then the age of information-on-demand really will have arrived! How times have changed! According to the ITU-T's ICT Facts and Figures 2017, 84.4 percent of households in developed countries (and 53.6 percent in the world as a whole) have Internet access and global Internet bandwidth grew by 32 percent in just the one year between 2015 and 2016. More users with more bandwidth, many with modern browsers that handle HTML5, have made possible ever greater use of streaming media. Collectively, the world now watches a billion hours of YouTube per day, while Facebook Video has rapidly become one of the most used features of the world's favorite social media platform since its 2015 launch. In 2017, the Pew Research Center discovered that online streaming is how a majority (almost two thirds) of young adults (aged 18–29) watch their TV programs. That's largely due to services like Netflix, the world's most popular streaming movie service, which had reached 139 million subscribers by the start of 2019; many of its movies and TV shows are available in HD. Reliable, affordable, high-quality streaming of audio and video is now the norm; two decades ago, when Rob Glaser was granted his original streaming-media patent, it would have seemed like a very distant dream. About 6 in 10 young adults in U.S. primarily use online streaming to watch TV by Kristen Purcell, Pew Internet & American Life Project Report, September 2017. Younger adults are more likely to watch streaming media than TV. The State of Online Video by Kristen Purcell, Pew Internet & American Life Project Report, June 2010. A review of social trends in Internet video (from which I drew the data for the chart up above). Streaming Systems by Tyler Akidau,‎ Slava Chernyak, and Reuven Lax. O'Reilly, 2018. One of the most up-to-date technical guides. Streaming, Sharing, Stealing: Big Data and the Future of Entertainment by Michael D. Smith and Rahul Telang. MIT Press, 2016. Much more of a business book than a technical guide, this offers an insight into how data analytics, subscription-payment, and on-demand viewing power the business models of streaming companies like Netflix and Amazon. Hands-On Guide to Streaming Media: an Introduction to Delivering On-Demand Media by Joe Follansbee. Focal Press, 2016. A well-informed guide written by a former employee of RealNetworks. Get Streaming! Quick Steps to Delivering Audio and Video Online by Joe Follansbee. Elsevier, 2012. A simplified but fairly comprehensive guide designed for people who don't want excessive technical detail. Streaming Media by Tobias Künkel. Wiley, 2003. A detailed technical guide for streaming media producers. Streaming Media Bible by Steve Mack. Wiley, 2002. Now rather dated, but still worth a look. How Disney Wants to Take On Netflix With Its Own Streaming Services by Brooks Barnes. The New York Times, August 8, 2017. Movie studios like Disney are thinking about reaching customers directly, potentially cutting out middlemen like Netflix and Amazon. Older children turn to online TV viewing: BBC News, November 25, 2014. How teenagers are switching from TV to streaming sites such as YouTube and Vimeo. As Music Streaming Grows, Royalties Slow to a Trickle by Ben Sisario. The New York Times. January 28, 2013. Streaming may be great for music fans; it's not so hot for performers and producers. Viewers Are Flocking to Streaming Video Content—And So Are Advertisers by Graeme McMillan. Wired, March 1, 2013. Streaming changes where the audience are, which radically moves the goalposts for advertisers and traditional TV-based broadcasters. Who owns streaming media? by Steven M Cherry. IEEE Spectrum. March 1, 2004. Explores the streaming media patent wars. 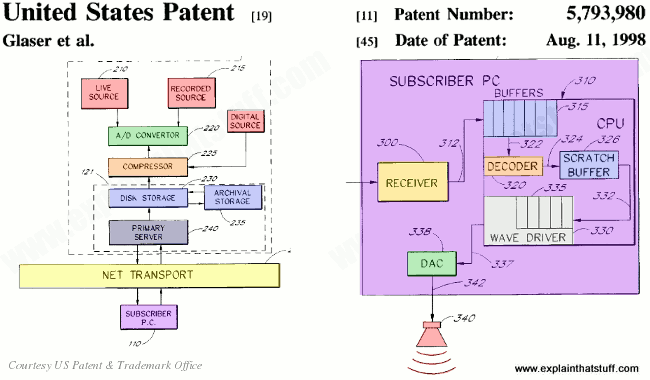 US Patent: 5,793,980: Audio-on-demand communication system by Rob Glaser, Real Networks, August 11, 1998; and US Patent: 6,151,634: Audio-on-demand communication system by Rob Glaser, Real Networks, November 20, 2000. The original Real Networks streaming media patents.